Well… it was a four day fishing "trip," so this is a long report. 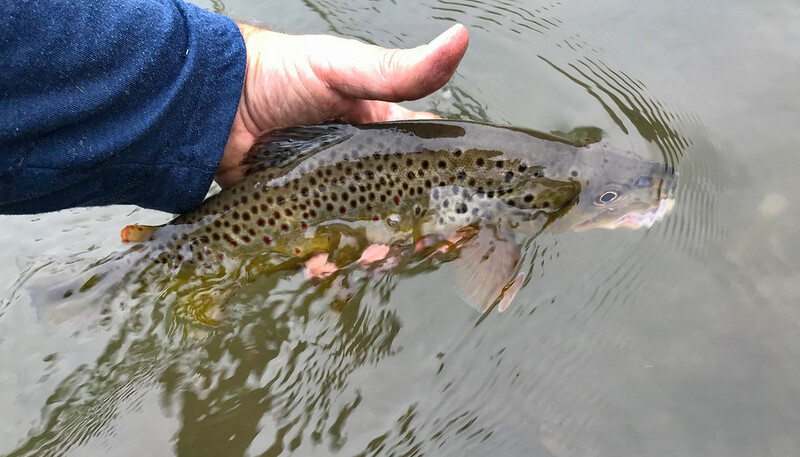 Initially planned on a 3 day closing weekend but when plans from the week prior got rained out, switched an unused day off to Friday, creating a four day trout-O-rama. On Friday, decided to fish close to home due to all the rain we had gotten and reports of blown out water statewide. 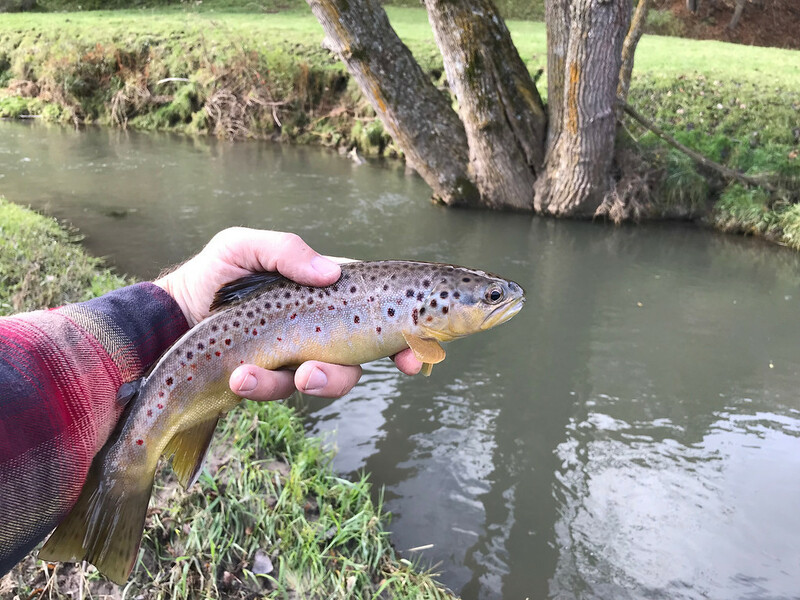 I regularly fish a couple of really narrow but deep streams that are usually less affected by heavy rain than most other places. First stream was higher than I expected with water cooking along and up probably 18 inches and over the grassy banks. Was quite clear though and therefore fishable enough. Beggars and choosers and all that. Got 6 browns over a 500-600 yard stretch and decided that wasn’t happening enough for closing weekend. A few of them were solid though, which was nice. Went far upstream on the other fork of this system hoping for lower water and better results. Found both. 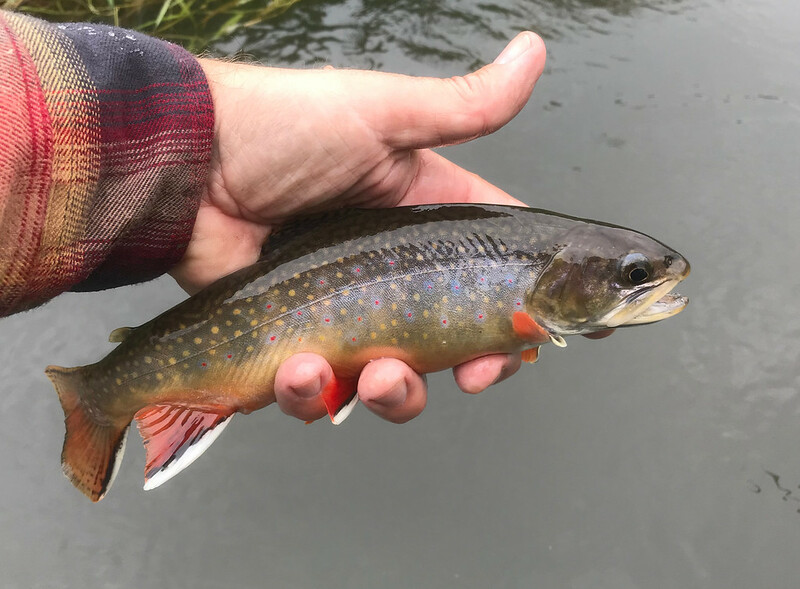 Got a bunch of solid (for this part of the state) brookies. 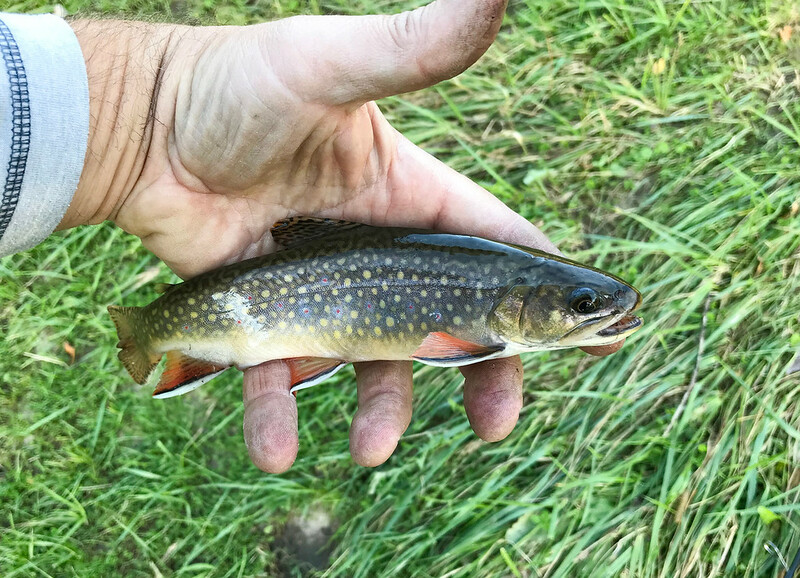 Eventually entered a pasture and the brookies faded away. Had an hour before I had to pick up my son from school. Went to a nearby culvert pool. It was high with the pipe actually half under the water, but just slightly stained. 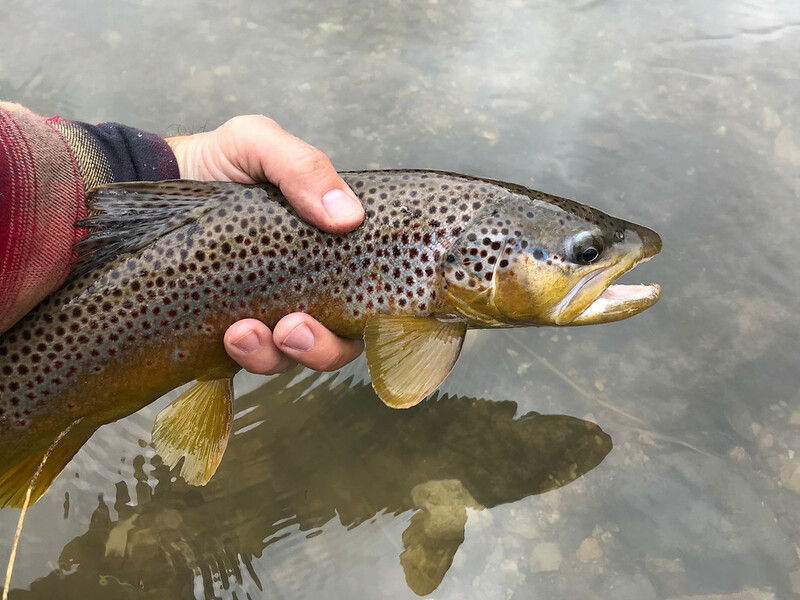 Coaxed only one, but it was a solid brown that gave some good tugs. 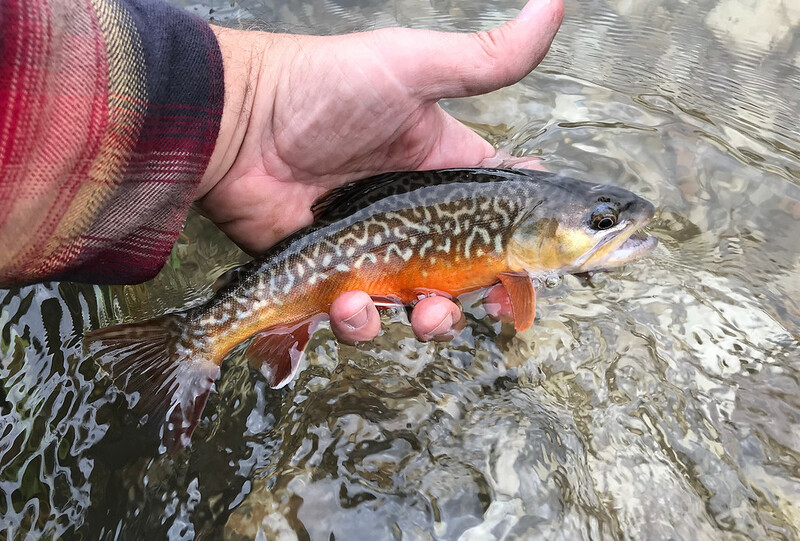 Beautiful fish to close the day. Modest day with only 17 to hand, but not bad at all considering the high water conditions and some quality fish caught. After outstanding pizza and friends at Greenbush and Badger hockey at the KC in a suite with the Brewers on TV on Friday night (in other words – crazy fun Friday night), headed to my buddy’s cabin in Grant County. Listened to the end of the Brewer game on the way and was just losing the signal and Uecker to tremendous static near Ridgeway when the final out was recorded. 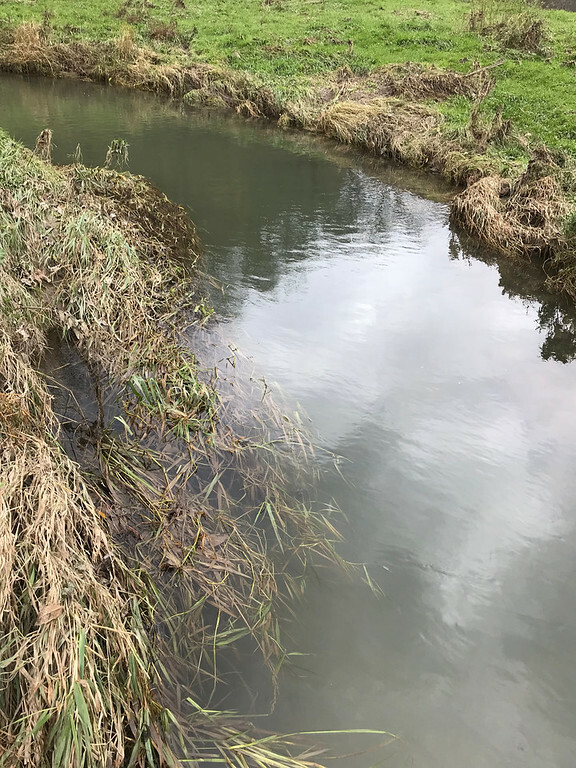 Got up and out Saturday AM and as I feared, my main desired big water target was not only high and over the banks, but also silted up with zero vis. 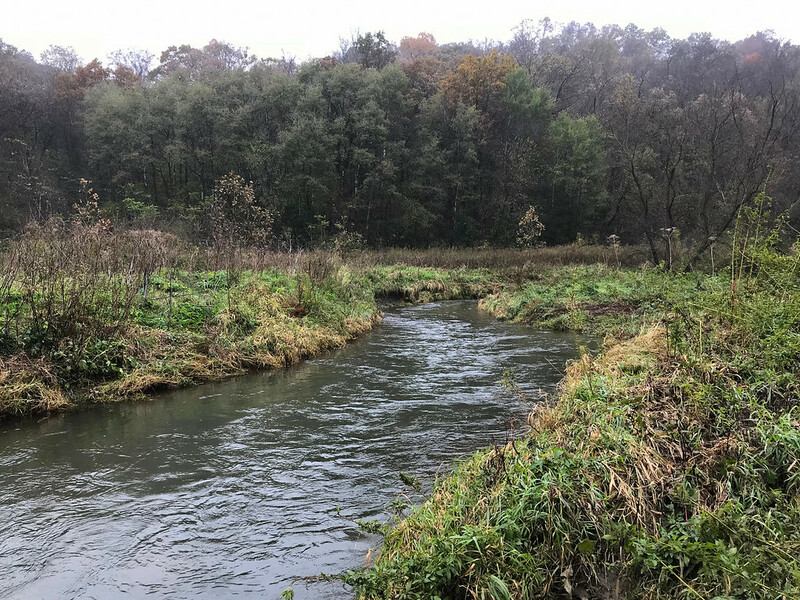 My backup plan consisted of an old favorite small stream in the general area and I was pleasantly surprised to find it clear and at normal flow. 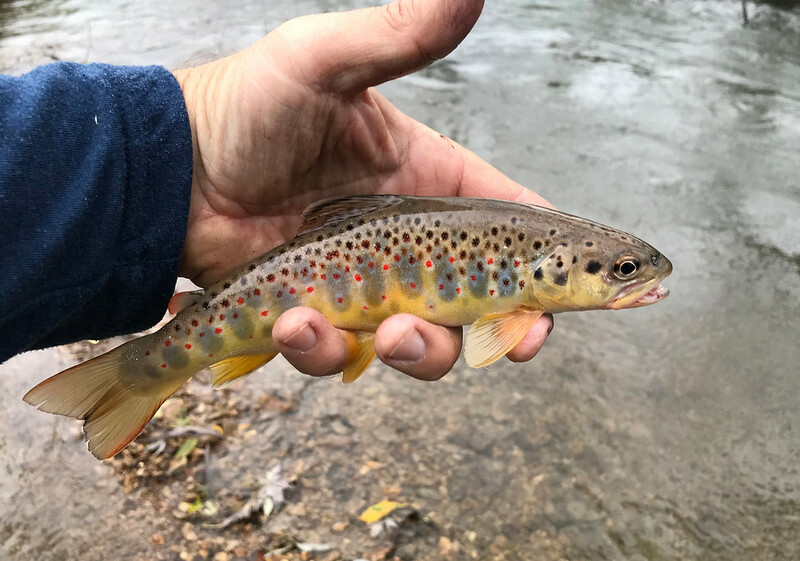 Spent the morning there and the fishing was slow compared to usual results for this stream, but managed a baker’s dozen of 7 browns, 5 brookies and one other fish. My third tiger ever and the most colored up. 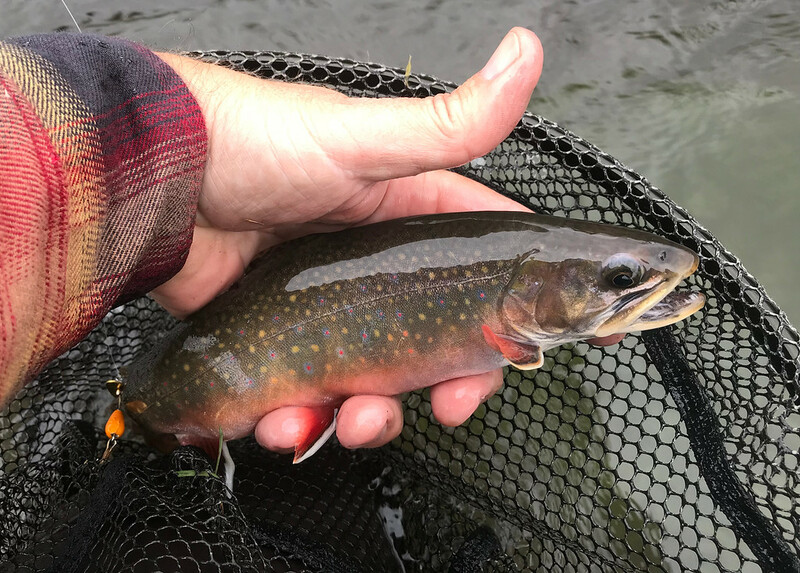 In fact, thought it was a pretty brookie when I saw it in the water. That’s a trifecta for this stream as I’ve never seen or heard of a rainbow in it. 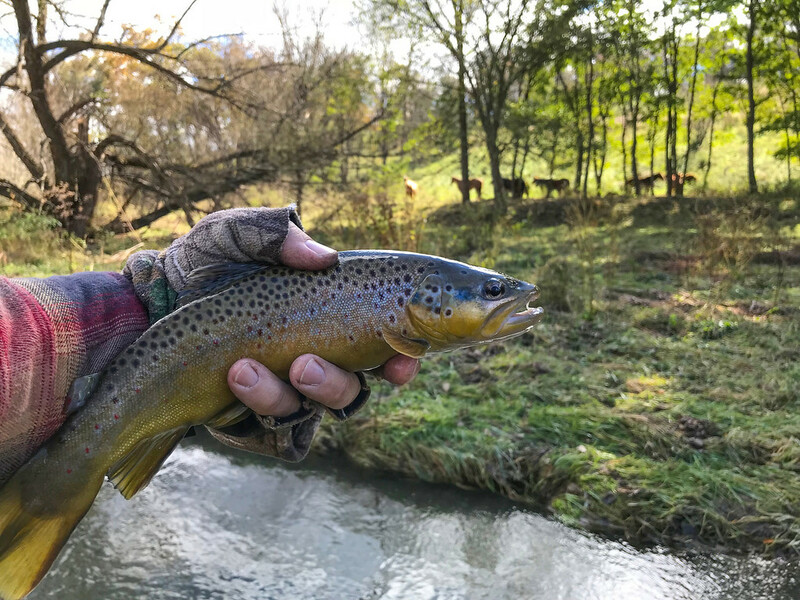 Met some friends around noon at another nearby medium stream and I didn’t take a single photo of any of the 17 dinks that I caught. I think the largest was maybe 12-13 inches. 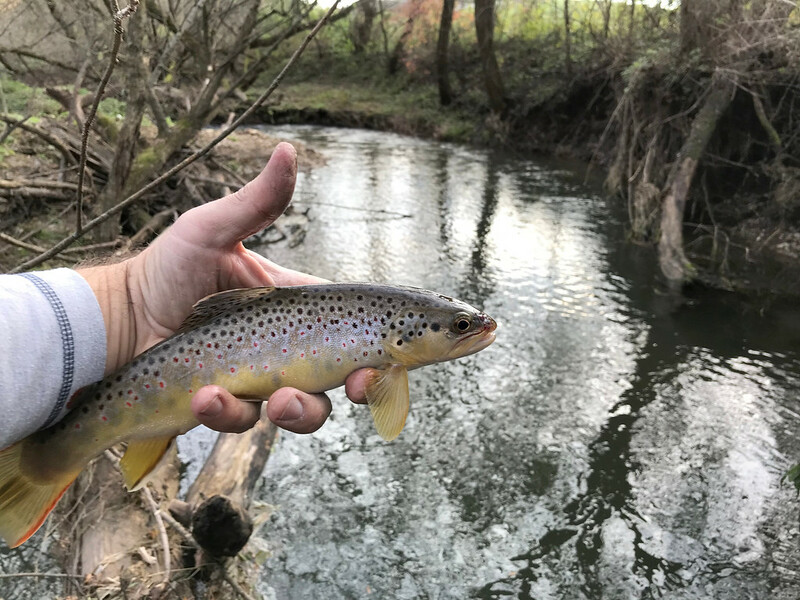 This stream is actually twice as big as the one that I had just gotten the trifecta on, but somehow has much smaller fish and typically just browns. 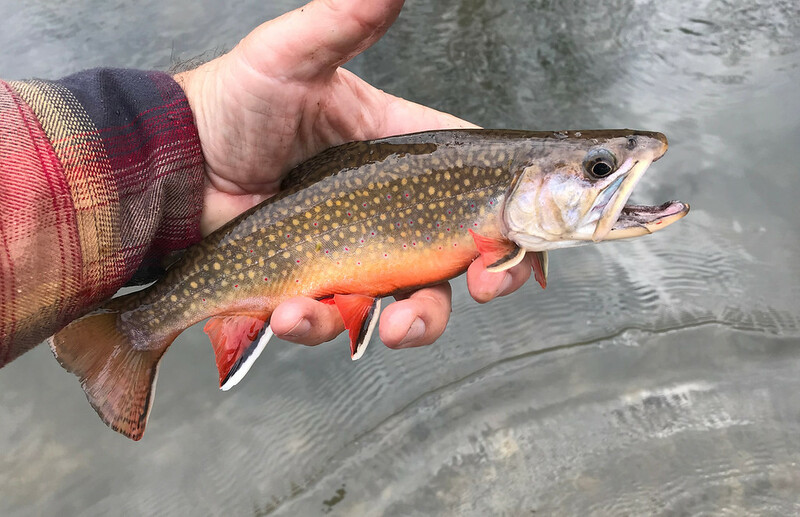 If the fish are all gonna be small, I'd prefer to have some brookies mixed in just for variety and color. 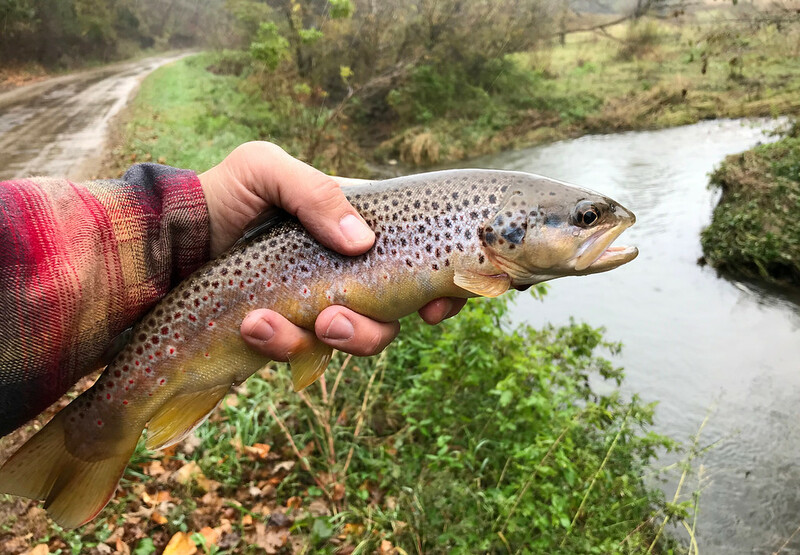 Friends went back to the cabin to get ready for the evening hunt and I couldn’t stand another second on the dink factory, so went to a skinny water trib of the big water that I had initially wanted to fish. Knew it would be clear and running high (relatively), which meant it would be the best it could be. 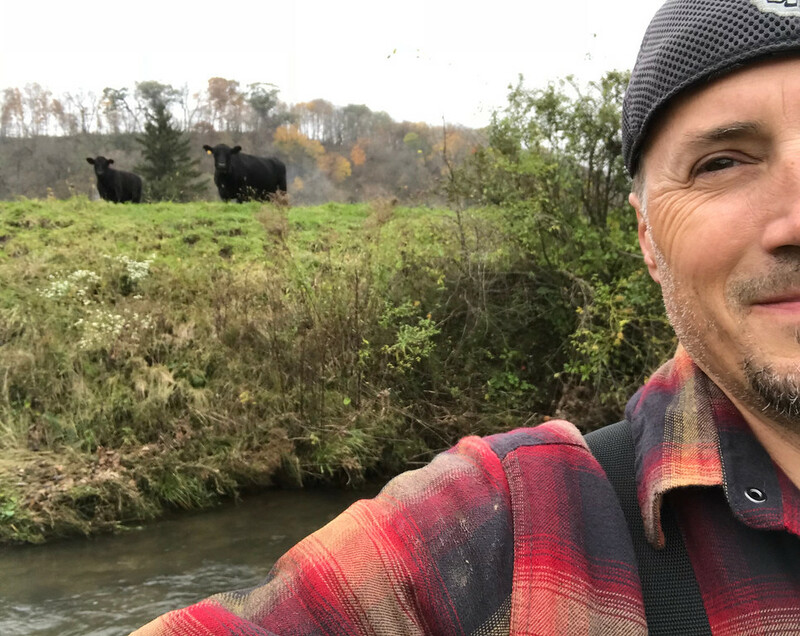 Had fished it before and knew that a big fish would be next to impossible, but was a pleasant pasture stretch on a beautiful late afternoon to finish the day and there really weren’t any other options nearby. 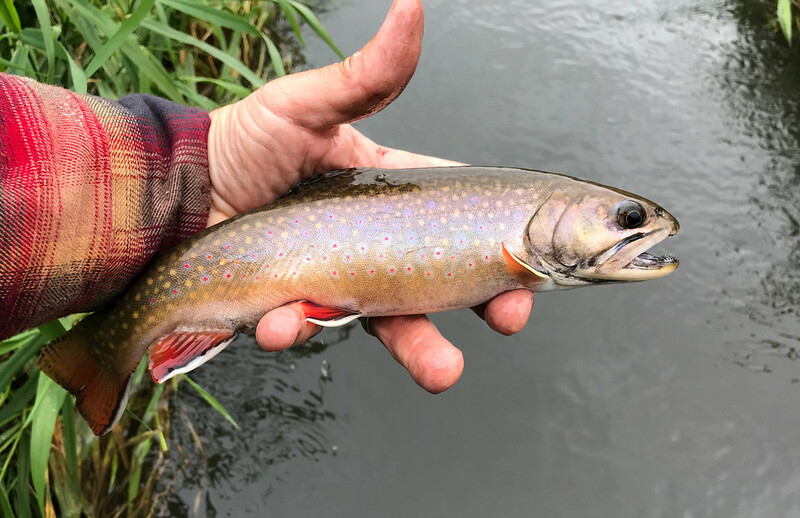 Don't mind dink/small fish fishing when the stream is a skinny trib and the little fish are expected. 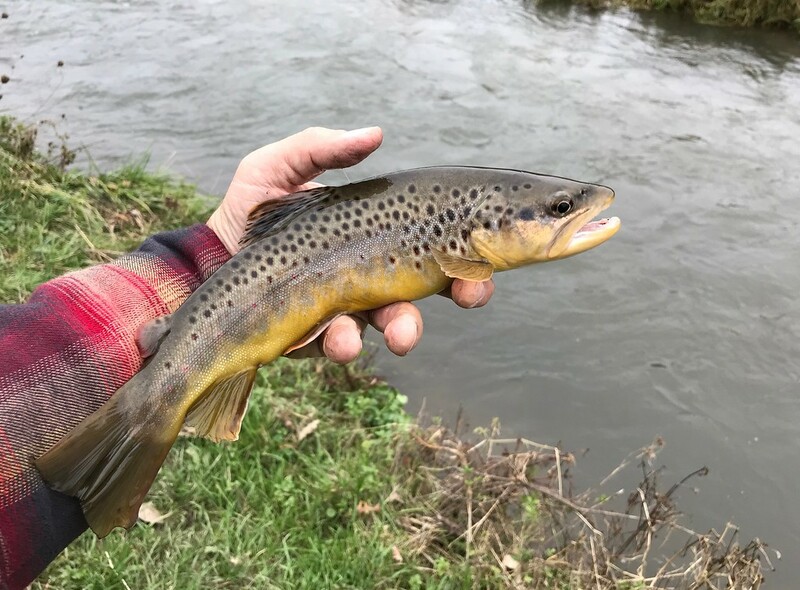 Got this one, which is a good brown for this little stream. 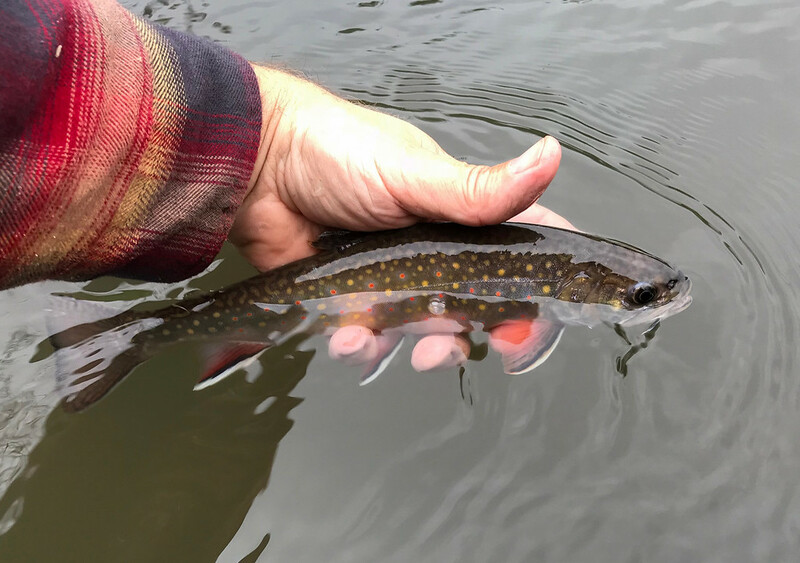 Got a solitary brookie, which is exceedingly rare in this part of the watershed. Fished past the pasture and into some woods where I hadn’t ventured before. 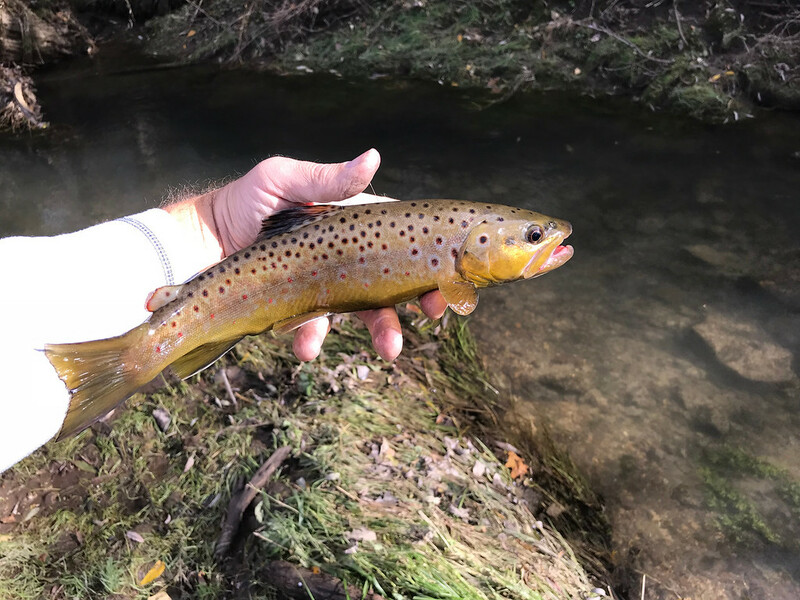 Found some nice pools and got several more browns, but nothing with any size. Still… a pleasant end to the day and a new stretch explored. 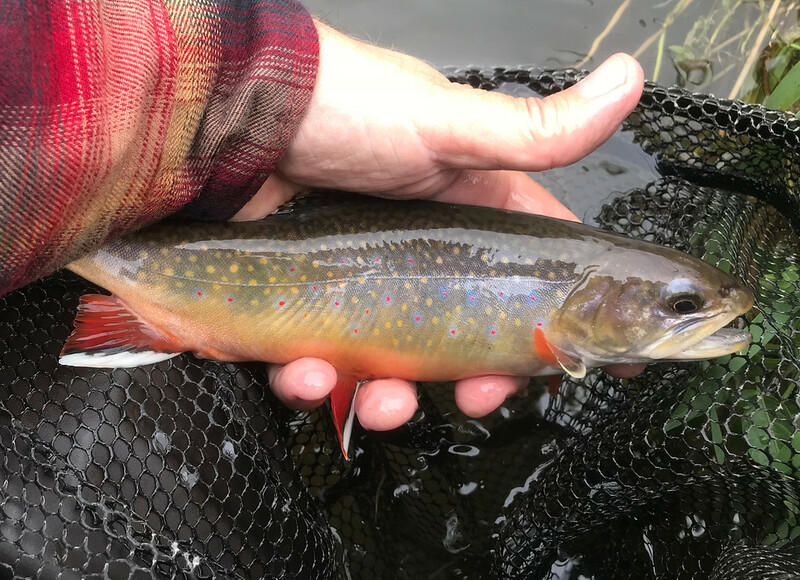 All told, almost 40 to hand on the day and while most were modest fish, was really happy with the 18 inch brown out of a small stream and the tiger and nice brookie from the same place. Went to the bar in town to watch the Brewers blow the end of game 2 and then to the cabin for venison tenderloin and a Badger blowout loss. Not a good sports day for sure. The plan for Sunday was to head north and fish some of the tribs of the lower to middle Kick hoping/assuming that I could find fishable small waters. Was up before dawn with the hunters at the cabin and on my way. Drove past the turn to another large stream in Grant that I enjoy fishing – one that I was sure was also blown out. Got a half mile down the highway and convinced myself that I should at least go have a look as I really wanted to fish some big water on closing weekend and I didn’t know of any in the area around the lower Kick that I was targeting. Good decision as the water was at perfect, slightly high/full volume and had a nice stain. Decided to try a short stretch and figure out what to do after that. Got four decent and energetic browns out of this first corner hole and the decision to stay was sealed. Worked my way upstream, catching fish in every type of water… riffles, runs, pools and quiet water. The stream was ON in a big way. 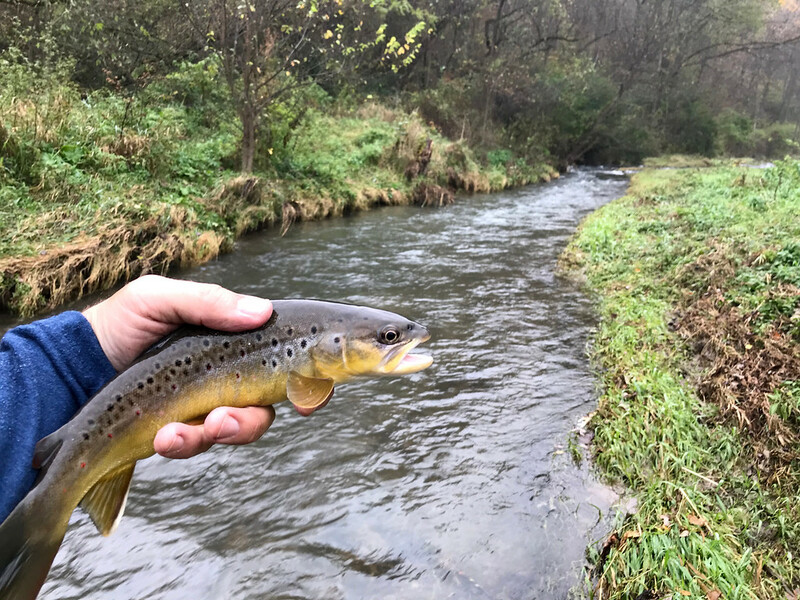 Came to a long, 4 foot deep run and was thinking that I rarely get any fish out of this run (had fished it many times before) and also that I never find any large browns anywhere in this stream, despite its size. 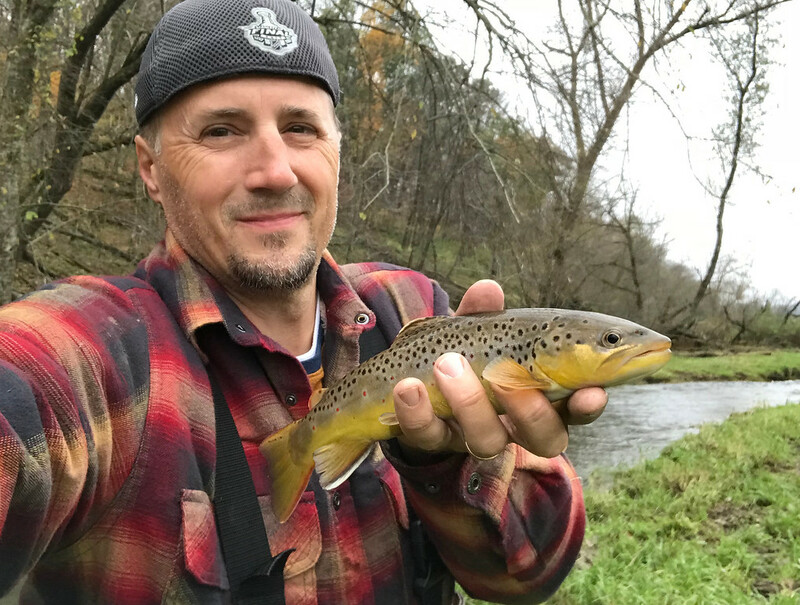 Caught a couple average browns and was preparing to move upstream when I got a very solid strike. 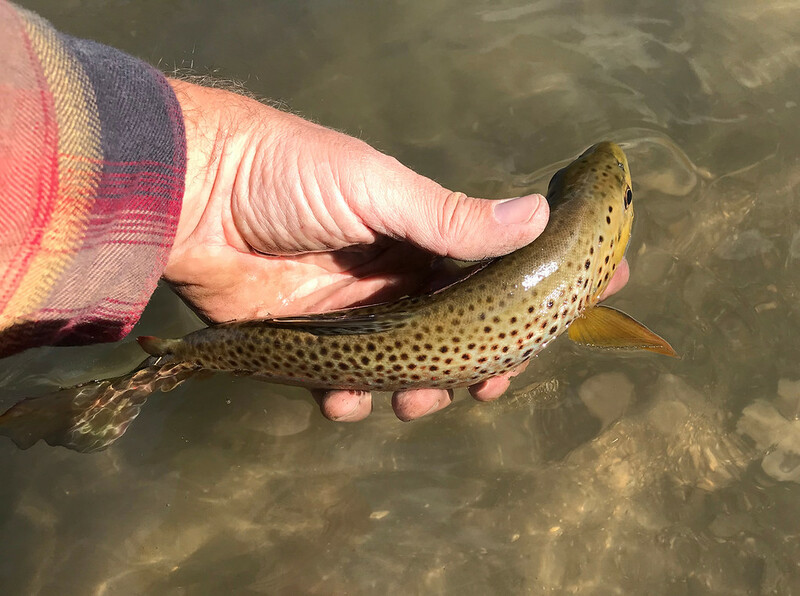 Got a glimpse of a large brown and was standing on the bank a full 3 feet above the water so worked/led the fish downstream about 20 yards to where I could get in the water and net it. Put a tape to it and she was just over 19 inches. 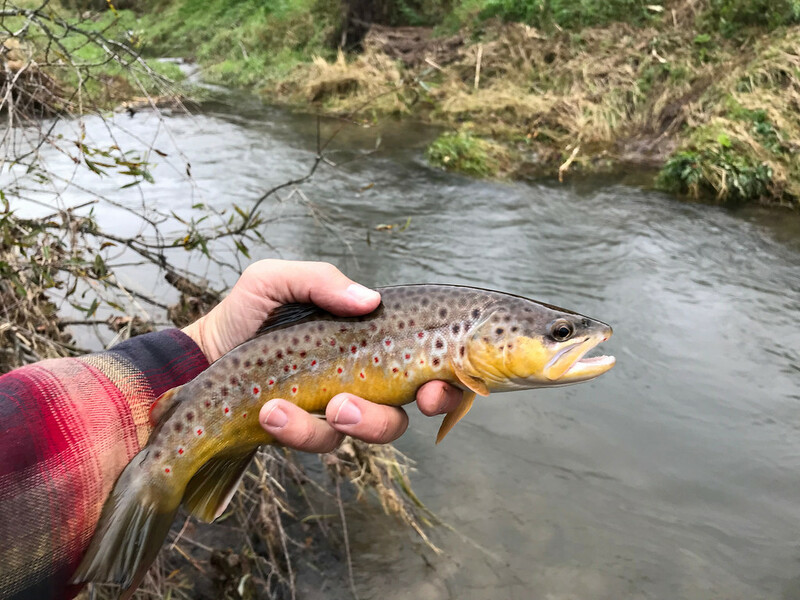 Had never even got a 17 (that I can remember) out of this stream, so was quite pleased with this fish. Continued upstream and got fish after fish. Most were from 11-14 inches or... FUN-sized. All bent the rod and had to be worked a bit to get in on the little ULs that I was fishing with. 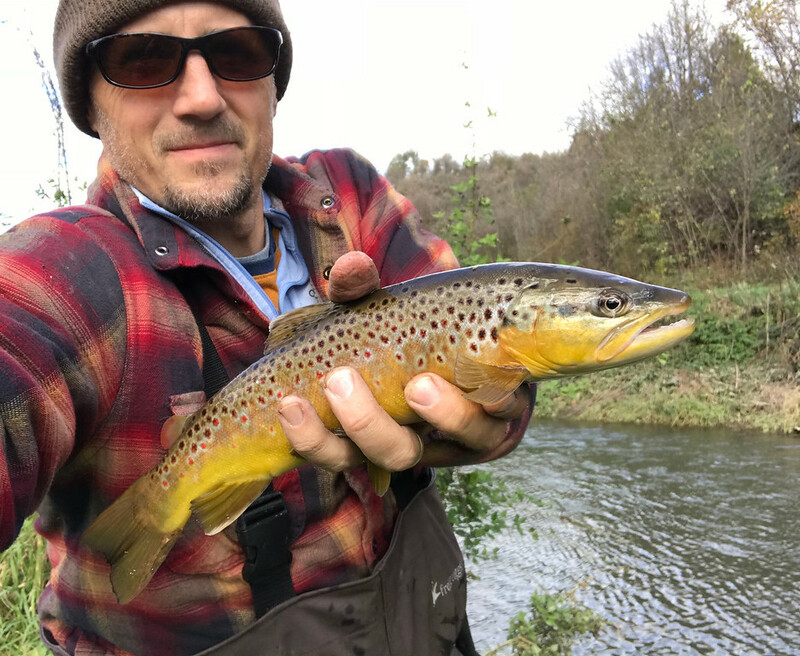 Kept a trout fishing log again this season and the brownie below got me to quadruple digits on the season. We had a photo together for posterity. Finished the stretch after I came to this, which was new this season. Was surprised when the large, beaver-pond-like pool above it yielded nothing. I usually get multiples in spots above dams. Not sure how this one gets cleared, but my guess is that the stream will eventually just go around it as a field is to the left. Around 1:30, it was time to head home and spend a little time with the family. 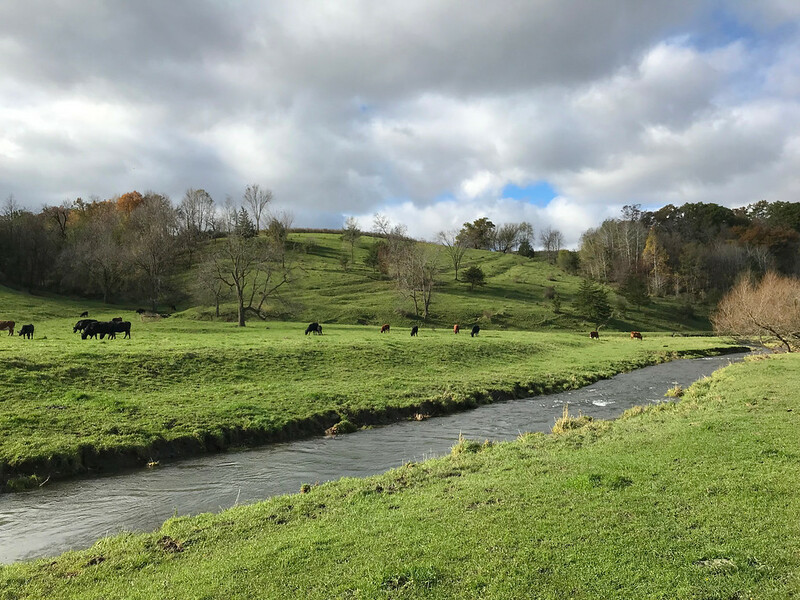 As I was heading up the road, saw a little corner pool in the upper part of the stream that is right next to the road and that I have driven past numerous times and ignored. Was past it, but thought… why not try it? 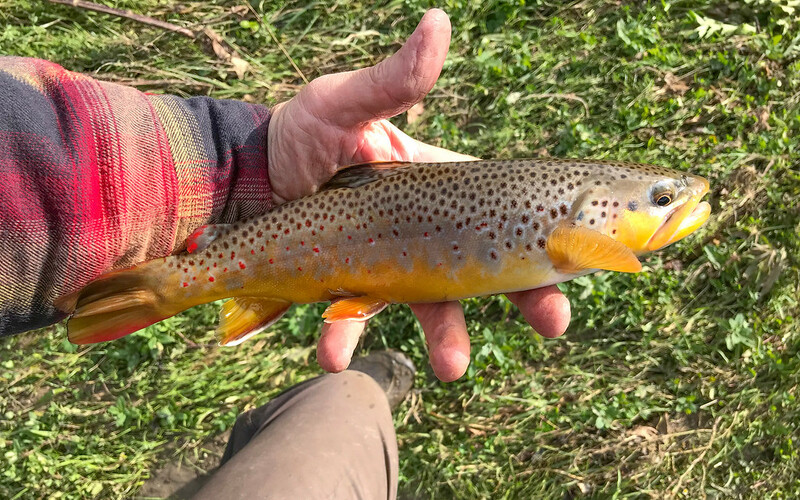 On the third cast I hooked into another large brown and could see it was at least an 18. Was on a 5 foot bank above the water, didn’t have my waders on anymore and didn’t have my net and was using a 4’8” UL with 6# test. Slid down the bank on my arse while keeping tension on the line while trying not to slide into the water and waited for an opportune moment and then lifted the fish straight up, dropped my rod and caught the fish in my arms. Could hardly believe my gambit worked and was thrilled as I really wanted this fish. Had my tape in my pocket and it was another 19. This photo is a bit blurry as it had been drizzling for a bit. While unhooking her, sitting/leaning on/against the bank, a giant wolf spider crawled onto my knee. I'm not typically freaked by spiders, but I may have shrieked a bit from the surprise of it and then had a good laugh. Hooked yet another big fish in this same corner although not as big as the 19 and it got off when it ran into a tangle of submerged barbed wire, leaving the lure in the wire and no fish. Lost the lure too. Great little finish to an epic, 56 fish day. Probably should have stayed until dusk coz it was one of those crazy active days on the water, but was content and went home to hang with the family for the rest of the weekend. 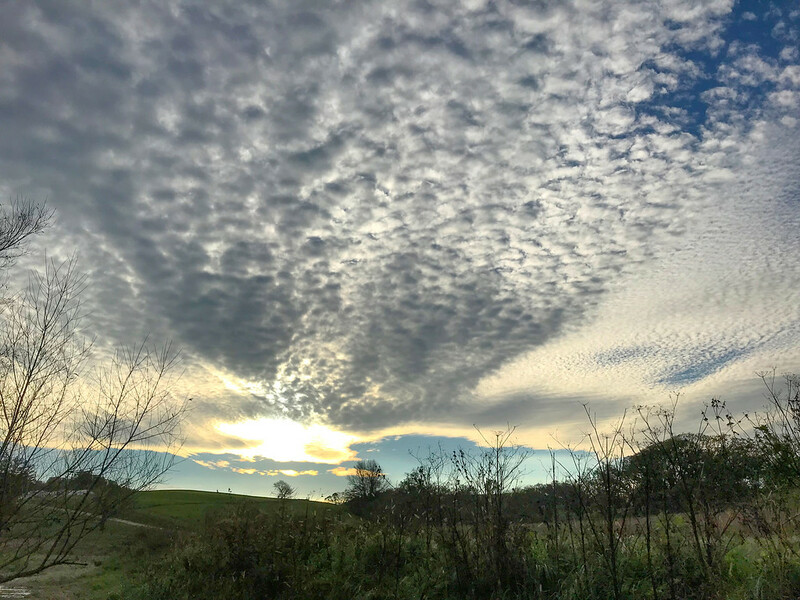 Closing day featured new weather as a front had come through Sunday afternoon and it was 20 degrees colder with a strong northerly wind and full sun. 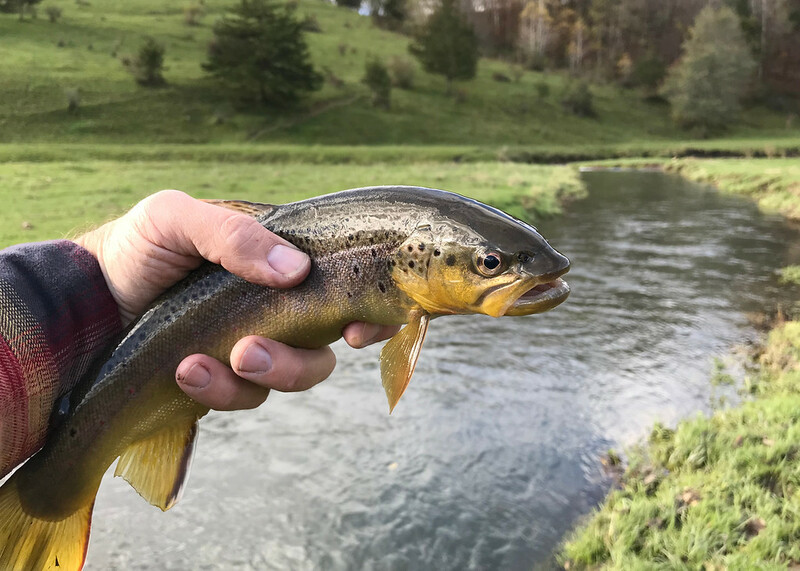 Time to wrap this report up, so suffice to say that I went back to that same large stream, but fished 3 new stretches that I had never hit before. 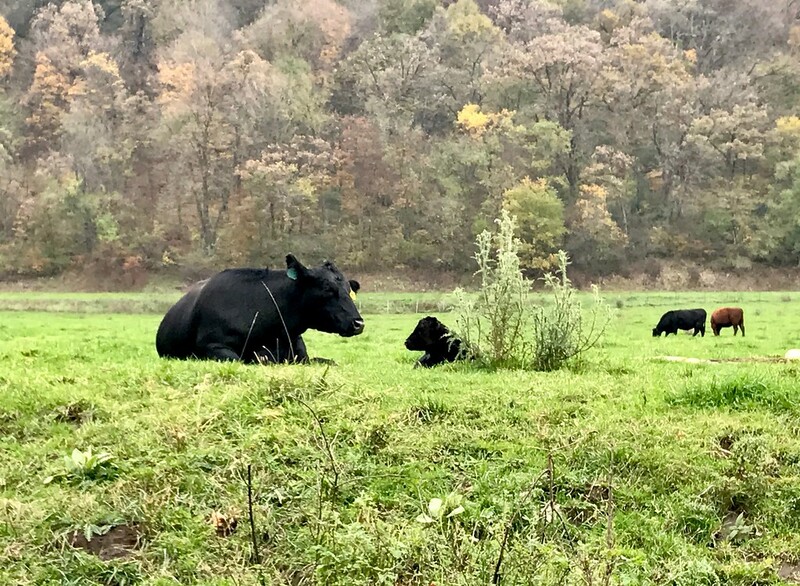 Even asked a farmer and got permission to fish his property, which isn’t part of the easement. 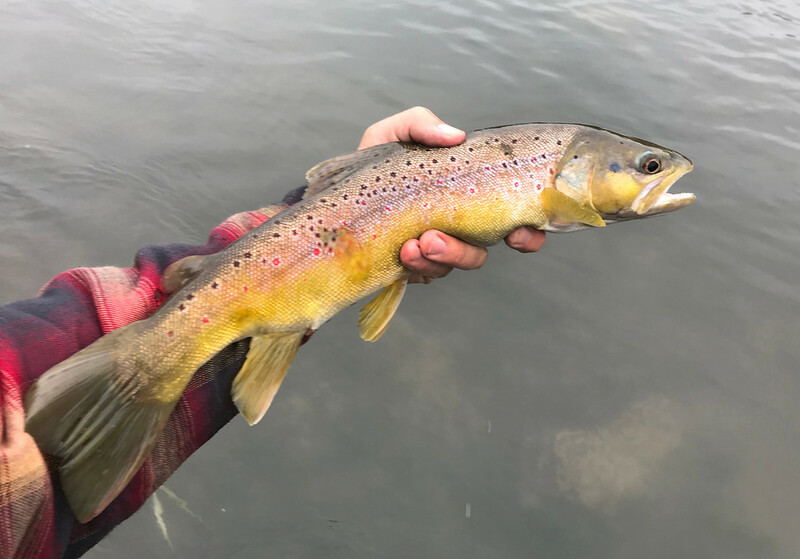 Caught another 56 browns, but the big fish from the day before were nowhere to be found and the largest of the day, which is pictured above, was a 15-16 incher. 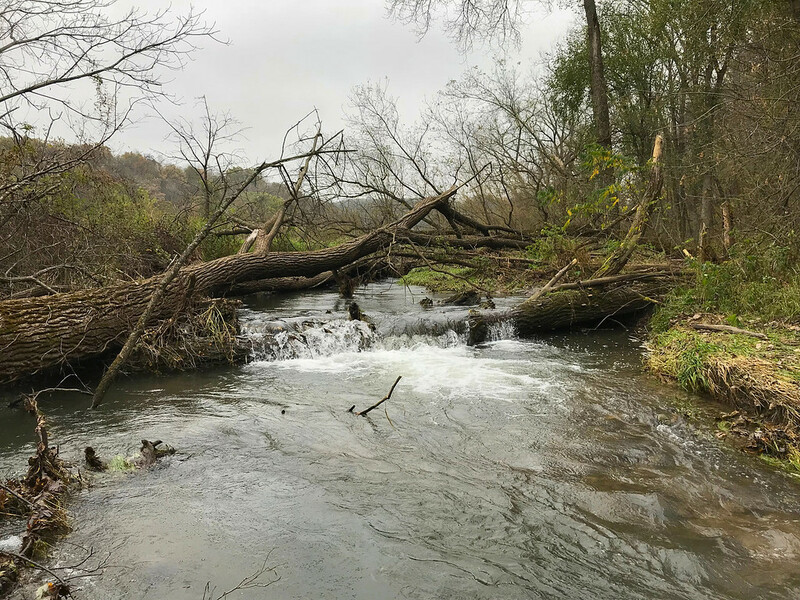 Around 2:00, decided to head towards home and finish up on the same watershed that I had fished on Friday, figuring that the water would be lower and near ideal. 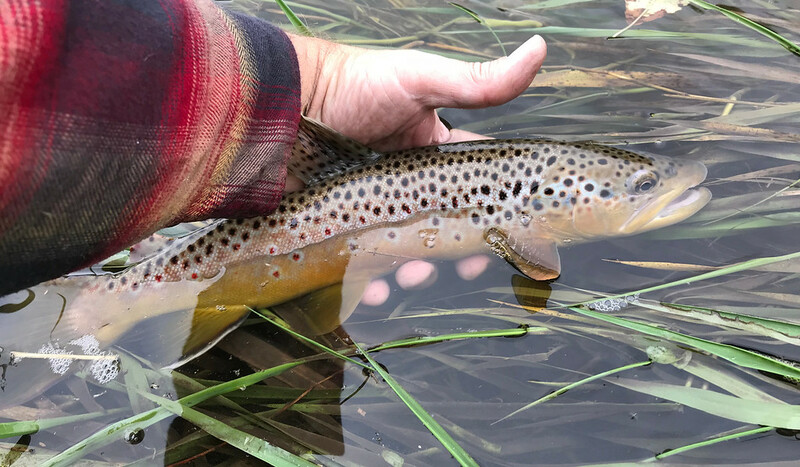 The fish were not active at all – almost like winter fishing - and only managed 4 more small fish to close out the season. This out of two of my most productive streams of the season. Oh well, the Trout Gods taught me humility a bit as a parting shot. A big part of the reason I take photos is so that I can reflect after the fact and have something tangible for my efforts and memories. That and I often don't get a great look at the fish I catch in real time as I am trying to get them back into the water quickly. Looking through these photos, I appreciate this closing weekend a lot more in hindsight than maybe I did while I was in the grind of it. I am (we are) truly blessed to be able to pursue this in such a beautiful area with such incredible fish. Great end to an absolutely phenomenal season. Looks like a great way to end the season! I really enjoy the colors on that tiger and some of those browns. 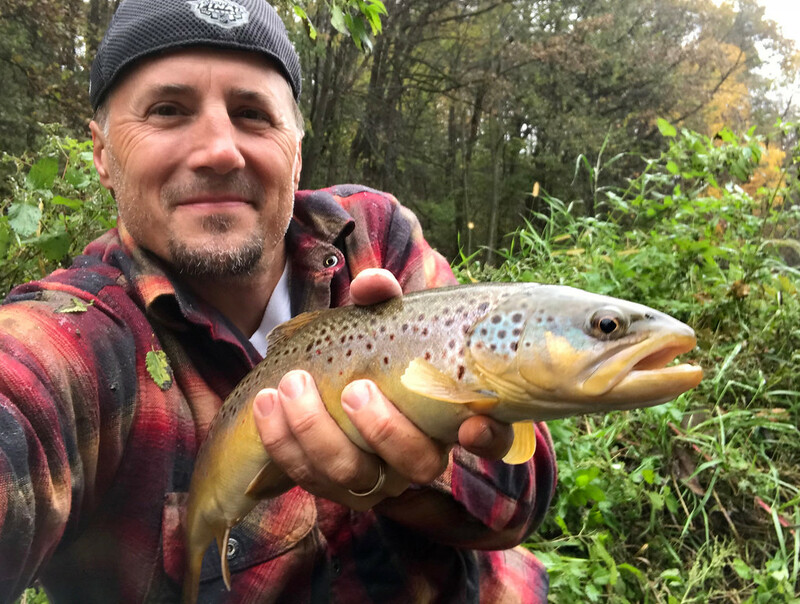 For me I always realize how much fun trout fishing is after I'm done fishing, all the little casting mistakes, falls, lost fish, bugs or other errors you make just seem to be forgotten and I always think dang lets do that again. 1 user thanked billybigbilly for this useful post. A great report Gurth, and a fine way to end the season. 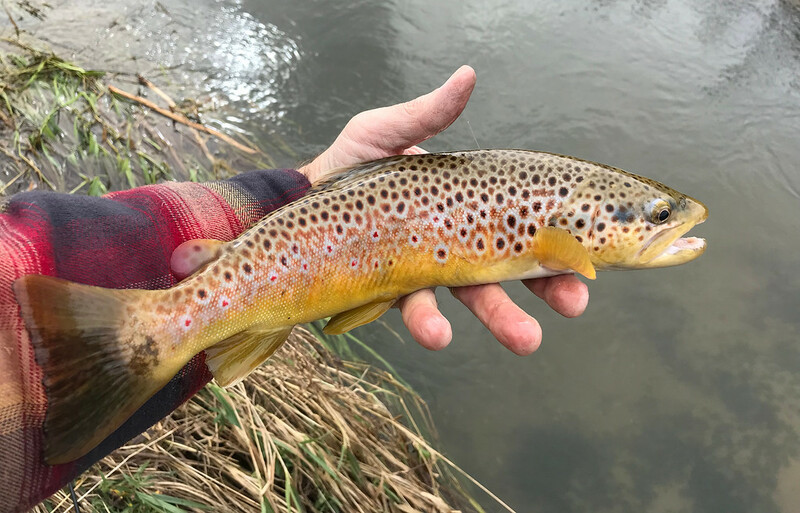 I must say, this Brown Trout really has spectacular markings. Almost looks like some kind of hybrid. 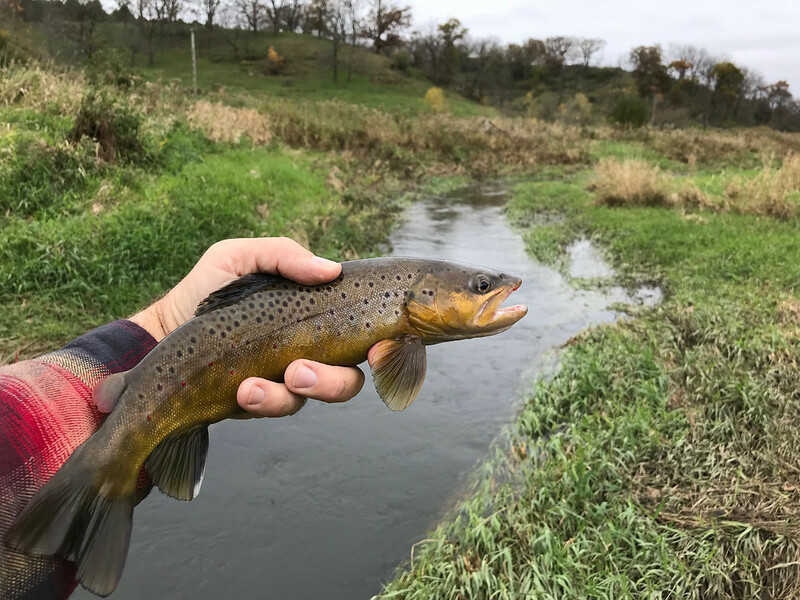 Always impressed with the variety of Brown Trout in the Driftless. You've had a epic year both in numbers and in the quality of fish caught. Congratulations! Yeah Bill... I'm always a sucker for par markings on a brownie like those. That was easily one of my favorite fish of the weekend. Similar to a Golden Trout... which of course is a bucket list fish for me. 1 user thanked rschmidt for this useful post. Only 3 weeks to a possible early November outing!